What goes into BIHU TEA? Plenty of rain, bits of sparkling sunshine and the rich, loamy earth of the Bhramaputra Valley in north east India are the ingredients used by Mother Nature’s to create the finest tea on earth: Assam Tea. Only the tender top leaves are hand-picked to make BIHU BOLD. Tippy buds are what gives this black tea its rich and robust taste. 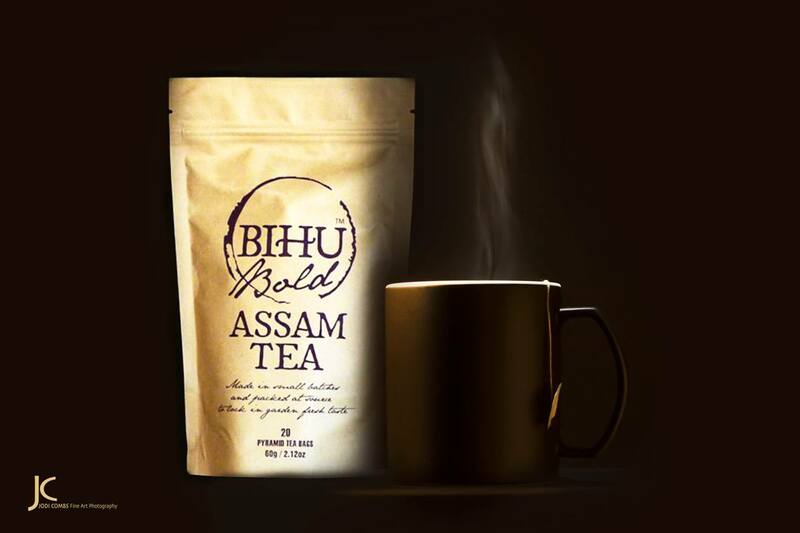 BIHU BOLD is the perfect tea to jumpstart your mornings and fuel your day. Bihu Bold teabag steeped for 5 minutes makes a perfect cup and pairs well with milk. I am a primarily a writer and I never expected to be in the tea business. But here I am! It all happened very organically. I suppose it was just meant to be. My father was a veteran tea planter. You can say tea is in my blood. Four years ago I wrote my debut novel Teatime for the Firefly . The story is set in a remote tea plantation of Assam in north-east India and brings to life the colonial world of British tea in the 1940’s. I was surprised to find most of my American readers (primarily coffee drinkers) had heard of Assam nor tasted Assam Tea. I wanted them experience the same tea that I had grown up with: good, strong, garden fresh Assam. In America that was nowhere to be found. I don’t claim to be a tea taster or anything but I can tell a good tea. Most of the Assam teas I came across were “shelf weary”. They lacked vibrancy, bounce. “Bounce” is perhaps an odd word to describe tea but I think it captures the character of fresh Assam. True Assam is robust and strong. It has muscle– thanks to its high caffeine. This is the tea I love and remember from my childhood. I can still smell the warm heady aroma of fresh tea that wafted off the chimneys of the Duklingia Tea Estate factory where my father was the manager. The smell of garden fresh Assam is wired into my brain. I wanted this same tea for my readers. Garden fresh; soul-enriching; good, robust Assam. And I was not willing to settle for less. My long-winded search led me to the tiny tea planation of Chota Tingrai near Tinsukia in upper Assam. To keep the garden-fresh quality, it was essential for the tea to tea-bagged and packaged at source: in the tea plantation itself. The end result is BIHU BOLD, my own brand of tea in partnership with Mana Organics. It’s been a long journey but I think I have something marvelous to share with the world. I’m sure you will agree. Getting ready for soringtime planting! I would have squeezed in more if I could fit it in. Nurseries and Bookstores are death traps!